Buon giorno and welcome to Stefano’s RomeCabs, Rome’s leading company for quality transfer and tours in Rome and beyond. Just about everyone who visited Rome is familiar with Circus Maximus (Circo Massimo) not far from the Colosseum at the foot of Palatine Hill. 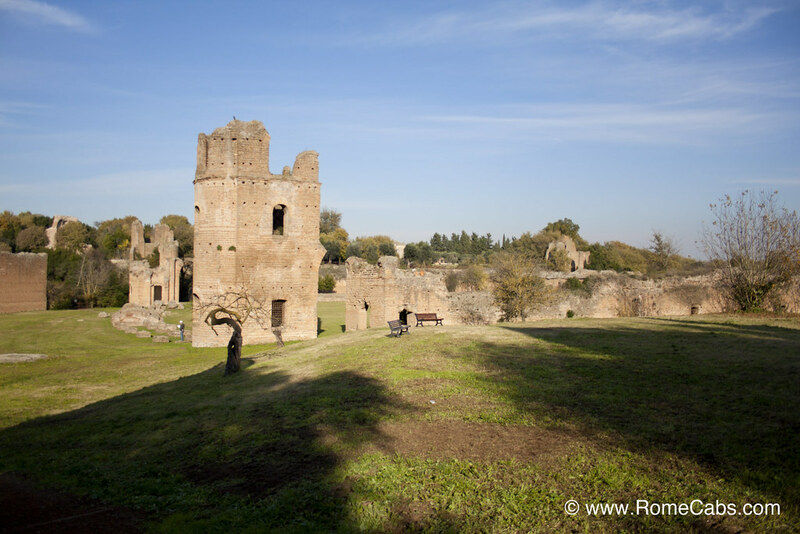 Not many people are familiar with another ancient race track: Circus of Maxentius (Circo di Massenzio). Situated along Via Appia (Appian Way), Circus of Maxentius is smaller than Circus Maximus at 513 meters long and 91 meters wide, and accommodating only about 10,000 spectators. The central spine (spina) of the stadium was adorned with Egyptian obelisk that now stands in Piazza Navona (topping the Fountain of the Four Rivers). In spite of its lesser size and fame, Circus Maxentius is by far the best preserved ancient Roman stadium of its kind. During his brief reign, Emperor Maxentius initiated many building projects including such as the Basilica of Maxentius inside the Roman Forum, and the imperial complex that includes the Circus of Maxentius. This stadium was not used as often as Circus Maximus in Rome, and perhaps why it’s better preserved. Archaeology also discovered that the tracks within the stadium were covered with sand even during the ancient times. The only games recorded in history were its inaugural games. Quite possibly, they could have been funerary games to honor Emperor Maxentius deceased son Valerius Romulus who died at a very young age in 309 AD. The site also includes a palace and a mausoleum known as the Tomb of Romulus where his son is believed to have been interred. This was the first imperial residence that combined a palaces with a stadium. In 312 AD, Emperor Maxentius was defeated and killed by Emperor Constantine during the famous Battle at the Milvian Bridge. After this major defeat, Emperor Constantine (also regarded as the father of Christianity as he legalized Christianity in Rome whereas before it was illegal) possibly donated the imperial complex of Maxentius to the Church of Rome. Currently, Circus Maxentius is under the care of Soprintendenza Archeologica di Roma, and it is open to the public for visits. Thank you very much for choosing Stefano’s RomeCabs for your Transfers and Tours in Rome and beyond.